How can we get our undergraduates involved in research? That's the question. We know students learn better and stay interested in careers in science if they become actively involved. That's why it's so important to support the science campaign. 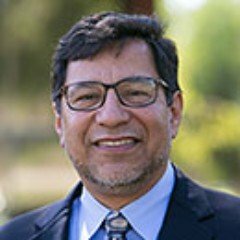 At Gilead Sciences, Inc., Arnold Gutierrez, PhD, developed the chemistry manufacturing process to produce life-saving HIV drugs. He also became a member of the Commission for the Sciences at Cal Lutheran. It’s a role he relishes because he is able to participate in the advances occurring in the sciences at Cal Lutheran. Arnold, a first-generation college student who had earned his Ph.D. in chemistry, and his wife Esther, an educator, support the science campaign, fund chemistry faculty fellowships and established the “Rise High” scholarship for first-generation Latino university students. The couple’s son David ’14 majored in chemistry at Cal Lutheran, went on to earn his master’s, and now works as a research associate with Gilead; he is preparing to pursue his PhD this fall.